The Presumpscot Regional Land Trust coordinates volunteer water quality sampling throughout the region. If you would like to volunteer in 2019, please see more information here or use this form to sign up. 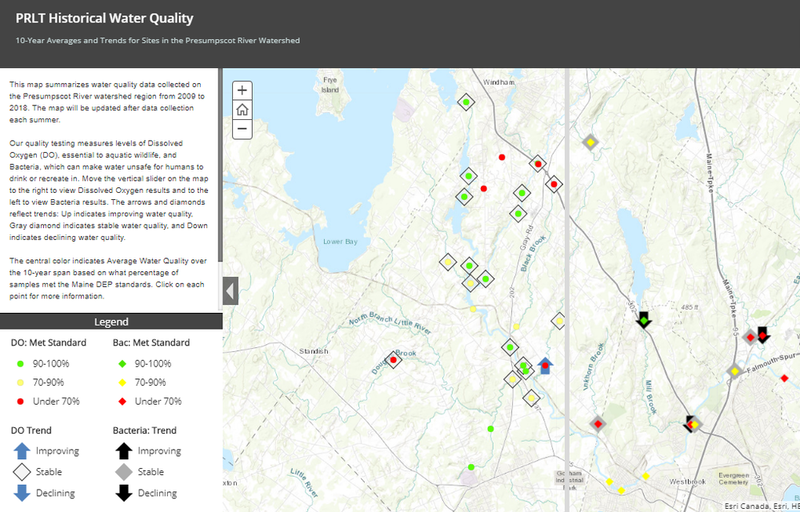 We have just released a new online map that shows 10-year averages and trends for water quality at our sample sites. Please click on the map to the right to explore a full-screen version. Samples are tested for E. coli bacteria. These bacteria come from animal feces and affect the suitability of water for people to drink and recreate in. Dissolved oxygen readings are also taken at each site. Dissolved Oxygen reflects the habitat quality of water for wildlife. Levels are low when excessive nutrients in the water cause algal blooms. Averages shown on the Historical Map reflect the percentage of total samples that met the Maine DEP Standards for bacteria or dissolved oxygen levels, respsectively. Trends were calculated from abundance readings. First, all samples taken in a year were averaged. This resulted in 10 yearly average numbers for each site (n=10). Linear regression analysis was then performed to determine if there was a significant trend (p = 0.10) for the site and whether that trend was positive or negative. All sites that showed no statistically significant trend are shown in the map as diamonds. Sites with no trend symbology did not have enough samples to calculate a trend. You can explore the results from last year's Water Stewards program below. Please click here to see a full-screen version. The Presumpscot River watershed covers much of Greater Portland and is the largest freshwater input into Casco Bay. As the region has quickly grown, so has recreational use of the river; there are now over 20 water access points for paddling the river, several swimming holes, and numerous great fishing spots. Clean water is critical to safe recreation and for healthy wildlife habitat in the watershed. The Land Trust uses the findings from the Water Stewards program to help identify important places to conserve land and work in collaboration with partners on restoration projects. A new interactive map, available to view online (see top of page), shows changes in water quality over the past 10 years. The map includes sites along the Presumpscot River from Sebago Lake through Standish, Windham, Gorham, Westbrook, Falmouth and Portland. 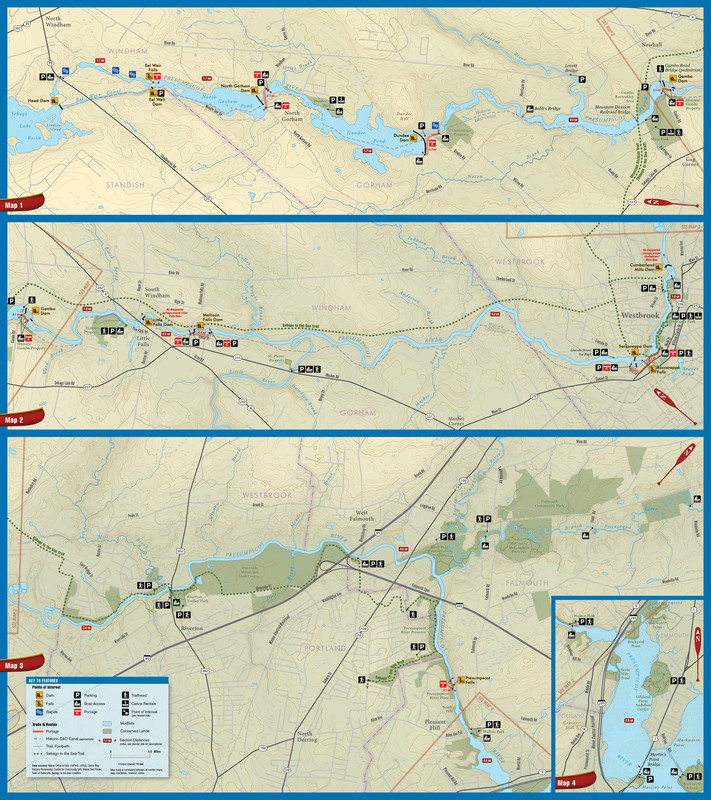 Click here to access the Presumpscot River Paddle Map to explore water access sites and portage routes all along the Presumpscot River.